Encaustic (to burn in) is a fascinating and versatile genre. It refers to use of beeswax as a constituent of a painting process involving melting of the wax at some stage. A wide range of possibilities exist within the encaustic arts and it would be both limiting and misleading to state any particular formulation as the encaustic paint. We particularly sell and promote ways of using a type of encaustic wax which does not contain any resins. Encaustic Art THE ORIGINAL products were begun by Michael Bossom in the late 1980’s and in 2017/2018 were updated with refreshed packaging and product expansion. 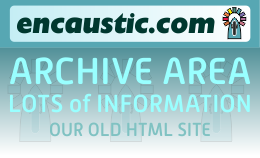 This site also contains information about other approaches, especially in the archive sections. Many creative possibilities are offered by the use of heat, an invisible force, to alter the structure of cold wax (solid) into one of a liquid wax (molten). Nothing is lost, only temporarily relaxed into a workable state. Once the heat is removed then the encaustic wax returns to a solid state and remains like that unless reheated. It’s a magical experience and with more practice can be extremely rewarding to explore. Applying molten wax colours with the iron can spread, tool and fuse a single layer creation beautifully. Starting encaustic art is as simple as deciding to start and then getting hold of the iron, the wax colours, some cards and a place to work. Even your very first card experiment could be something that you cannot bear to part with! The Starter Set is a lovely box in which there is a Painting Iron, 16 wax colours, A6 & A5 white cards, a metal scribing tool and an introduction in 5 languages (English, Dutch, French, German, Spanish). This is a beautiful gift for anyone who is remotely interested in creative activity – no previous painting skills required! Encaustic art is about using molten wax as a creative medium. Electricity means that temperature controlled tools enable far easier working of the wax paint medium than that which our ancestors had to master. The genre of encaustic arts can span all ability levels, from complete beginner, through the crafts & hobby arts & on into the finest of fine arts. Generally the encaustic art product line uses heated tools to melt & apply the wax block colours onto card or other surfaces. Thin application means a rigid support is generally not necessary & fusing occurs during the application process. Here are some Starter Sets for working with iron and wax. 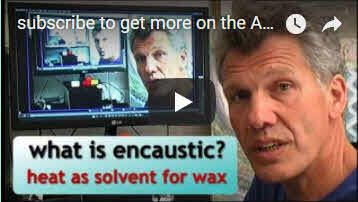 encaustic.com has a number of areas & facilities to help you understand the encaustic medium in its many forms. There are videos, step by step methods for simpler work & a shop for the encaustic art range of products. The waxes in the encaustic art range are formulated with waxes and pigments only & do not contain resins of any type – resin wax formulations often contain 85% beeswax + 15% damar. Resin wax is often applied as hot wax (molten) with cold tools (usually brushes) onto a rigid surface. It needs fusing with a heat source to meld the layers of applied wax together properly. Resin Wax information in the Archive. There are 2 main approaches. Hot tools melt the cold wax solid, apply and tool the wax colours and fuse them all in one go. It is a single layer process where the wax colours are fused and applied with the same stroke. Cold tools take wax paint from pre-melted containers, and apply them, usually to rigid surfaces. Fusing is then necessary to meld the layers applied into one cohesive piece of work. The online shop at encaustic.com is simple to use offers easy secure payment for fast service and peace of mind. Get what you need in a convenient way. We send worldwide but if you are outside the UK please check the encaustic art original importer list for all existing national partners around the world selling encaustic art – please support them.